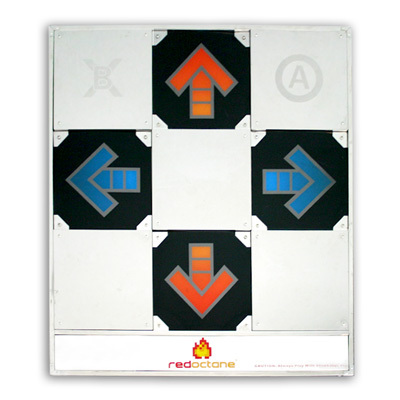 RedOctane invited me to their office to try out their new Afterburner metal dance pad with a beta version of their upcoming port of In The Groove for the PS2. After having tried out RedOctaneÃ¢Â€Â™s new Afterburner metal dance pad, I can confidently say that you will have no problems passing all those crazy level 12 songs on Expert Mode on ITG. Simply put, I completely agree with the guys at RedOctane when they say that this is one of the best metal pads out there on the market right now. The first thing I noticed when I was invited to try out the new Afterburner was that it seemed as sturdy as the initial version of the metal dance pad that RedOctane has offered in the past. The pad is more than an inch thick, and weighs about fifty pounds. On a carpeted floor, this pad did not move at all, even while playing high-speed songs with lots of jumps and 8th-note runs, such as Tell, Delirium, and Tension. This impressed me because when I tested the first version of the pad a year ago, the metal pad at the time did move slightly when playing Healing Vision - Angelic Mix and exotic ethnic. However, there are also some very noticeable differences right off the bat between the old metal pad and the new Afterburner. First of all, the two diagonal arrows that used to be in the upper corners have been replaced by metal sections similar to the center of the Afterburner pad. This means no more Solo Mode for those of you that still play DDR 4th Mix, or Extra Mix. The corners now are completely metal, but the best part is that they still function as buttons to be used before and after gameplay. The left corner is labeled with both an X and a B, while the upper right corner is labeled with a circle and an A. This is a visual indication of another great feature of the Afterburner: the Afterburner is 100% compatible with the PS2, the XBox, and the PC, and so the buttons have been labeled with this multi-system compatibility in mind. 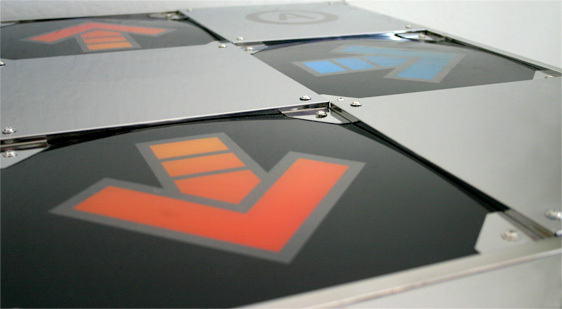 The adapters for all three systems protrude from the control box that comes out of the top of the pad, so you wonÃ¢Â€Â™t have to worry about the hassle of bringing cable adapters if you want to switch between systems. Of course, just because it is durable and can be used with both your PS2 and your XBox does not automatically make this a great pad. A metal pad is only good if it is sensitive enough while youÃ¢Â€Â™re madly try to get all those arrows accelerating towards the top of the screen. And so this is where I think the Afterburner really shines. I tested the Afterburner on songs with those infamous hands that ITG is known for, such as Bend Your Mind, Let My Love Go Blind, and Dawn. I was truly impressed when I got every single hand in those songs without having to make an extra effort to make sure I was pressing hard enough on all the necessary arrows. Also, even when only hitting arrows one or two at a time, it was very easy for me to tell where I was stepping on the pad since the arrows on the Afterburner are actually recessed quite a bit below the surface of the pad. Yes, thatÃ¢Â€Â™s right. The arrows are recessed, just like in the arcade, so not only do you feel where the arrows are, you donÃ¢Â€Â™t have to constantly worry about if you are stepping squarely enough on the arrow, because you will feel it right away. All in all, I walked out of RedOctane very pleased with the new Afterburner, and now IÃ¢Â€Â™m trying to convince my roommate that we have to get two of them so that we can play Doubles. RedOctane informed me that setting up two Afterburners for Doubles play is a snap, as each Afterburner pad comes with a bracket that can be tightened with a wrench, so that two pads can be joined together securely. However, I was not able to test this fully, as there was only one pad available at the time. I am not too worried about this, however, as I am sure that buying these Afterburners will allow me to save my tokens and play at home instead, where I finally wonÃ¢Â€Â™t complain that the pads donÃ¢Â€Â™t work or arenÃ¢Â€Â™t sensitive enough.